Before it started airing, Akame Ga Kill was the anime I was most looking forward to. Sadly, that excitement was brutally murdered even before the end of the first episode—and nothing in the remainder of first half of the series did anything but push me further away. Now before we get into it, let me be clear up front. There are a lot of things done well in Akame Ga Kill. The art style is great, the animation is fluid, and the music does a good job of supporting the action—which likewise is a ton of fun to watch. Thus, what ruins it for me is more along the lines of the setting and the way in which the story is told. On premise alone, Akame Ga Kill sounds great: A country boy comes to the city looking for work so as to help his poor village—only to find out that the government is hopelessly corrupt and the rich prey upon the poor—literally, in some cases. Thus he has no choice but to join a group of rebel assassins and fight “the Man.” The first episode pulls an excellent bait and switch. Tatsumi, our naive hero, comes to the big city where he is treated like crap by the soldier enlistment office, taken advantage of by a thief (thus losing all of his money), and forced to spend the night on the street. But as the story progresses, he is spotted by a kind, noble girl and taken into her loving home. The twist is that she and her family are all sadistic murderers. And on top of that, they have previously captured his two friends in the same way, with one already tortured to death and the second eventually dying in Tatsumi's arms. This unexpected turn does a great job of setting up the world, the conflict, and the stakes. But more than that, it is a hugely emotional moment for Tatsumi, where not only is his very worldview shaken but his best friends are dead. The series then proceeds to completely ruin this dramatic moment by immediately having the other characters cracking jokes as they kidnap Tatsumi; and he acts more like the straight man in an anime rom-com than a person in shock. This failure to smoothly and logically transition out of dramatic moments is quite common in the first half of the series (though it has thankfully been getting less and less pronounced as the series has continued on). Massive tonal shifts completely undercut many of the series' emotionally powerful moments. When you step back and look at it, Akame Ga Kill is really just a typical shonen fighting anime—a la Dragonball Z, Naruto, Bleach, One Piece—but with two tweaks to push it into the area of the seinen demographic: (1) copious amounts of bloody violence and (2) main characters who can and do die. Having a plot where main characters die is actually a great way to add tension to a story. More than that, it is an excellent dramatic tool that, when used well, not only causes the remaining characters to develop in new, meaningful ways, but also throws the viewer into emotional turmoil along with the characters. Of course, to elicit an emotional response from the audience, you must first make the audience care about your characters. This is generally done through character development and the exploration of backstory—i.e., things that take time. Really, each of the main characters who have died in the first half of Akame Ga Kill only got a single episode each exploring their backstory before they were promptly killed off. Sadly, after so little time spent focusing on them, I found it hard to care emotionally about their deaths on anything more than the most superficial level. By their very nature, fantasy tales require the watcher to suspend a fair amount of disbelief by the very existence of magic, monsters, or other similar elements that are not found in the real world. However, just because magic exists doesn't mean that anything is possible. A set of rules for the magical world have to be established so that the viewer can make a new baseline for narrative devices like mortal danger. If such rules are not established, then it is nearly impossible to build convincing drama. While Akame Ga Kill delivers magic in the form of its magical weapons, we learn that the various characters are human by our definition of the word. We see time and again that a sword cut to the throat or a bullet to the chest is just as deadly to them as it would be to us. Then we meet Seryu. Her secret weapon is a gun in her throat that fires out of her mouth. However, unlike a magical sword, a normal gun like this one is a real world item we can understand. Having one in your throat raises any number of questions: “How does she load the gun?”, “How does she aim the gun?”, “Doesn't the kick of it make her choke or gag?”, “Why isn't she coughing from the powder burns and/or gunsmoke?”, “How does she eat and drink?”, and the most basic question of all, “How can she even breathe?” Frankly, that is a lot of disbelief to suspend. It's made even harder for suspension to occur thanks to the contrived narrative that permeates her fight with the heroes. During the battle, she has her arms cut off mid forearm—revealing a machine gun hidden within one arm which she then uses against the heroes. Ignore for the moment all the insane implications about the medical technology of this world that is obviously decades—if not centuries—beyond our own. Instead, focus on what this means for the battle at hand: She had a gun installed in her arm that would be useful if and only if her arm was cut off at exactly the right place. How unbelievably lucky (read: contrived) that it was indeed cut off at exactly that place! I can see why fans of shonen fighting anime would like Akame Ga Kill—it’s basically a more grown-up version of what fans love but with more violence and less character plot armor. It's got dynamic action, awesomely designed heroes and villains, and looks great to boot. However, the way it tends to undercut its dramatic moments and kill off its main characters with little in the way of backstory and/or character development beforehand makes it hard for me to connect emotionally with—and thus care about—the characters. Moreover, in a fantasy world where the main characters are strikingly mortal, I find it impossible to suspend disbelief at many of the anime's more contrived or over-the-top elements. In the end, while I don't think it is a horrible anime, it is clearly one that is not for me. 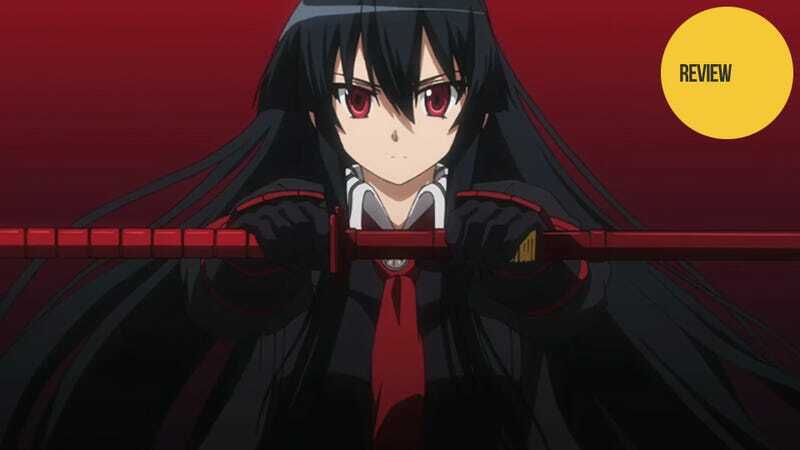 Akame Ga Kill is currently airing on Tokyo MX in Japan. It can be watched for free and with English subtitles in the US on Crunchyroll and Hulu.